Vintage and reproduction landscape and portrait paintings can be found in so many spaces around the globe from grand castles to tiny city apartments. 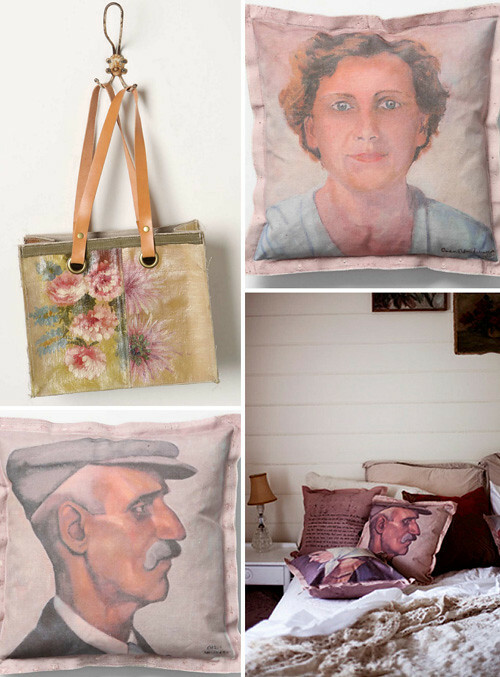 Thankfully they've been popping up more and more (especially portraits) and are being used in fresh ways (on pillows, bags, ceramics) though I still love them installed on a wall in interesting arrangements. 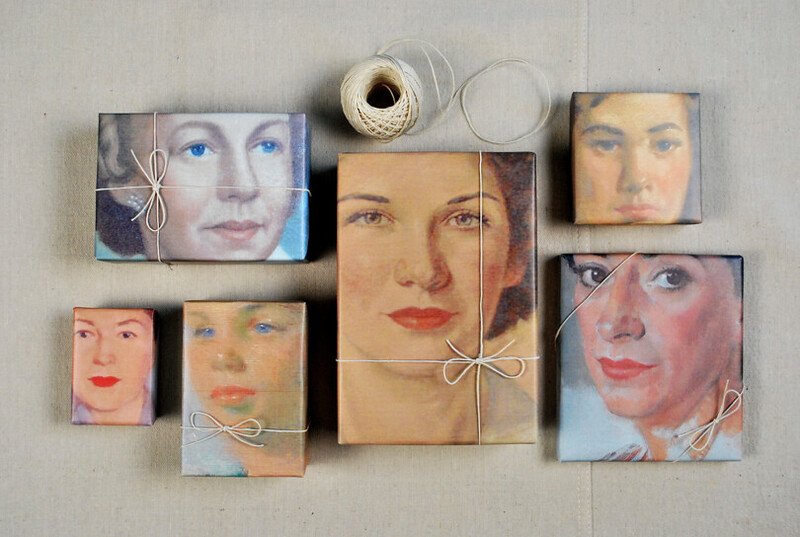 Most recently, vintage portrait paintings have made their way to gift wrap... And seriously, this is awesome. Wow, right?!? So on trend, too. Above we have the clever and stylish design duo behind Something's Hiding In Here to thank for this. I love their clever how-to on the Martha Stewart Craft blog - brilliant idea, "You can directly color copy an old portrait or bring a digital file to a copy center to be printed for you." Oh yes, please! 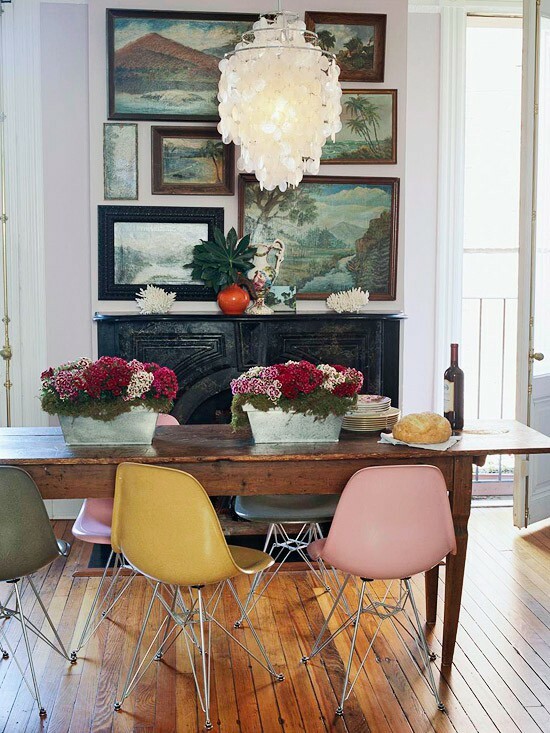 These photos show the home of stylist Emily Henderson who shared her California digs with super cool lady Victoria nearly a year ago and I noticed that nearly every room had a portrait or two. Hot! 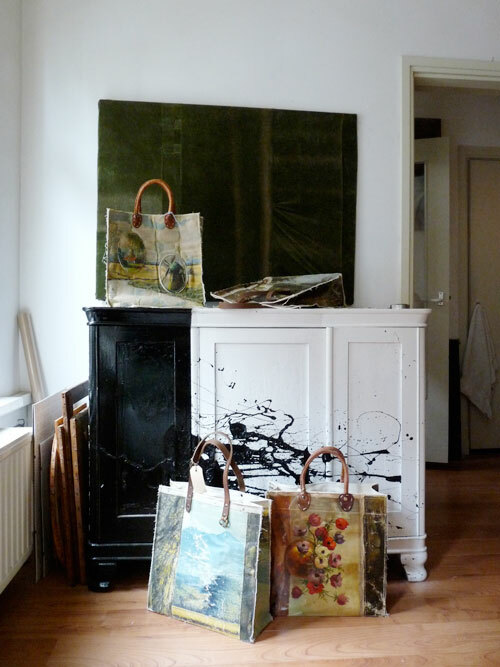 Ever since Leslie Oschmann gave me one of her vintage painting bags when I visited her in Amsterdam in 2010, I've had vintage paintings on my brain! We have tons of them at flea markets in Germany selling for nearly nothing. 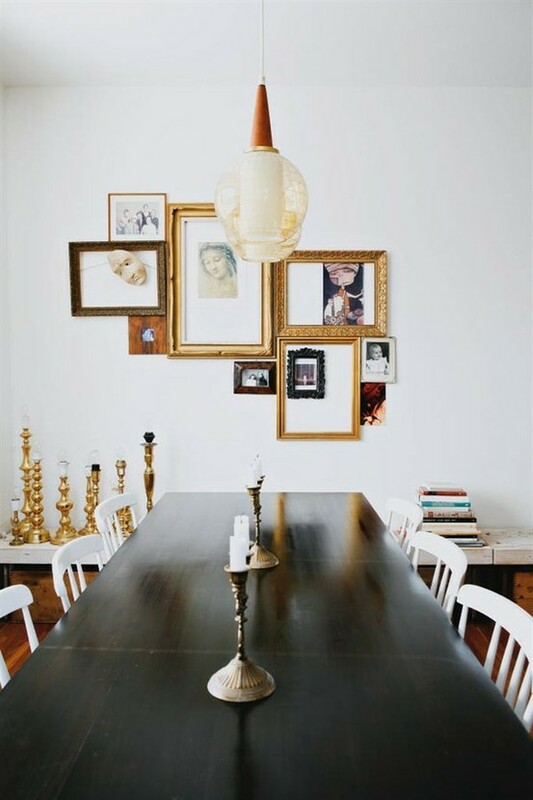 I've seen so many of these same paintings adorning walls in numerous homes featured in chic magazines and as props in catalogs throughout the years and I've noticed portraits quite often in the homes of stylists, bloggers and my online friends. Above you can see a photo of Leslie's bags made from vintage landscape paintings that I took. You can lay your sweet little eyeballs on more work that she's done on her inspiring super fab blog. 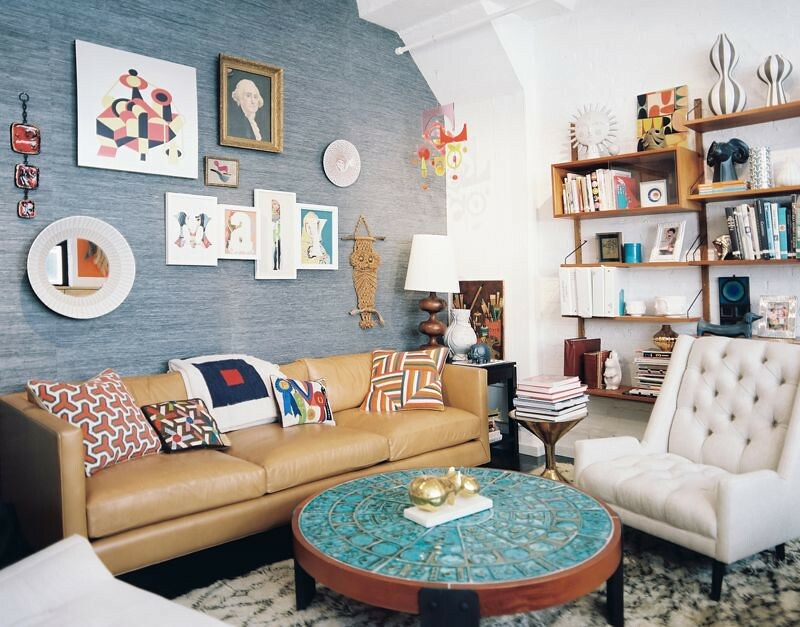 Leslie also designed a series of portrait pillows for Anthropologie recently as well as numerous other things from quirky altered chairs to travel bags and you can view all of Leslie's work here. The photo of her pillows on that pretty disheveled bed above was shot by Pia Jane Bijkerk. See that vase above? Oh yes, of course you do. It's a beauty. 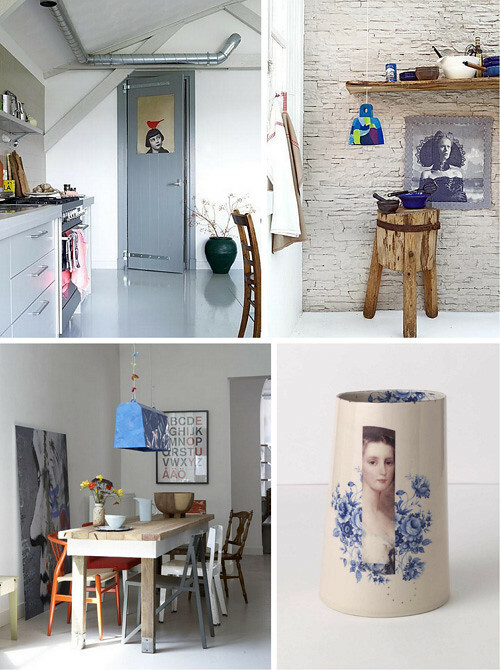 I love the Adam Harvey ceramic collection, I picked up a vase and a bowl at Anthropologie when I was teaching a mood board workshop in their London store this past September. The moment I spotted Adam's work with the pretty ladies on them I grabbed a vase and a tiny bowl and made a very spontaneous purchase! But I don't regret it, I love looking at both of my Adam Harvey pieces each day. They sit on my IKEA cabinet - I think they cost more than the cabinet but that's how I roll... High and low, old and new, I love a good contrast as I'm sure you do as well if you think of how you decorate. Anyhoodle, you can view more of his crazy intricate work on his website. 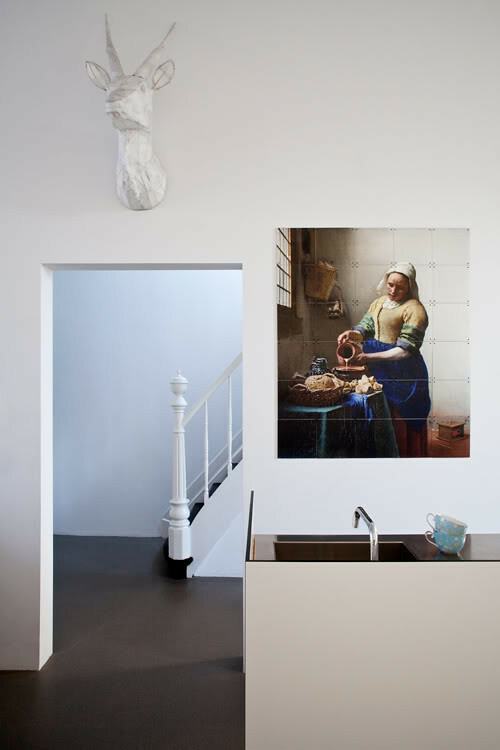 Speaking of modern interpretations of portraits, I also really like this screen printed scarf on the wall as art from Dutch mag VTWonen and this more modern portrait on a kitchen door, also from VTWonen but the poster is from France I believe. It's not vintage but I still love a good portrait and digital modern work suits me just fine. Here's something else that is quite fresh and modern from Dutch design firm ixxi. I really like what they are doing with the old masters but you can also upload your own image or images to their site and create your own great work of art. 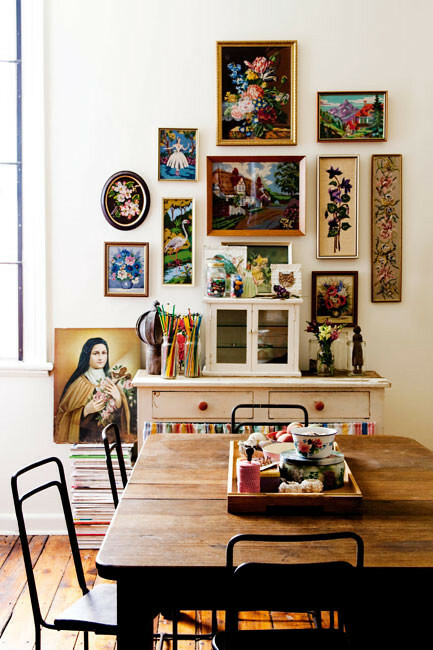 This is a well composed display of portraits in this photo from Homelife. I'm a fan of this look. You can also try some landscape vintage paintings in case portraits creep you out. Seriously, some people don't like eyes on the wall staring back at them! The above pic is from Better Homes & Gardens and looks sooooo cozy. I want to clear that table and lay out a massive handmade pizza with some red wine and play a little Frank, Dean and Sammy, baby! 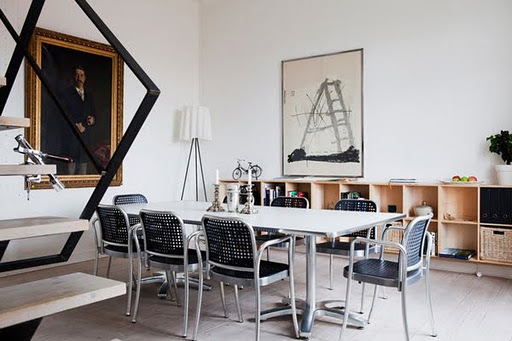 I really love this dining room, looks like something I'd see in Berlin for some reason. Maybe it's the fact that nothing works but everything works. Berliners are good at that. :) This is from my new favorite Tumblr blog, Convoy. If you know the origin of this photo, please let me know. The downside with lots of Tumblr accounts is the near impossibility of ever finding the owners of the photographs. :( Drives me a bit bonkers. How about a little George Washington action from Lonny mag. It's subtle but obvious at the same time. 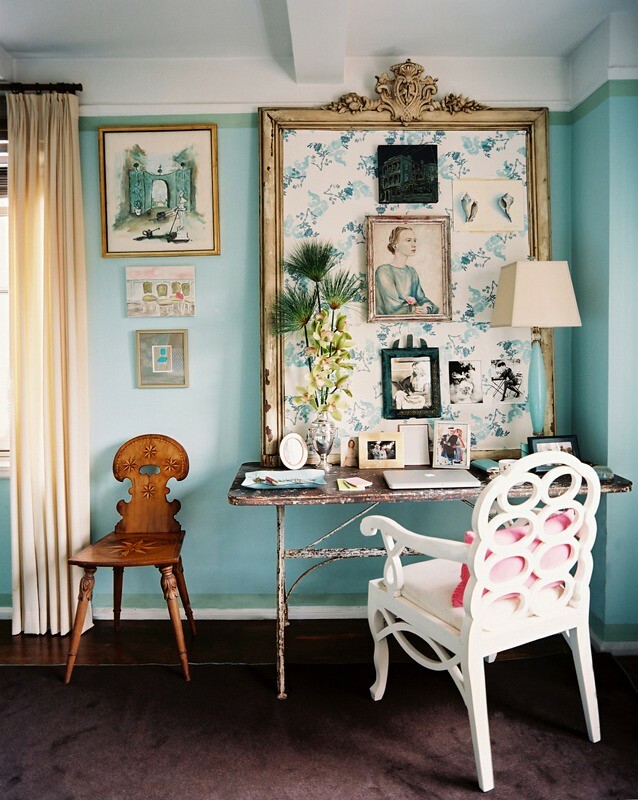 And yes this room was designed by design giant Jonathan Adler! 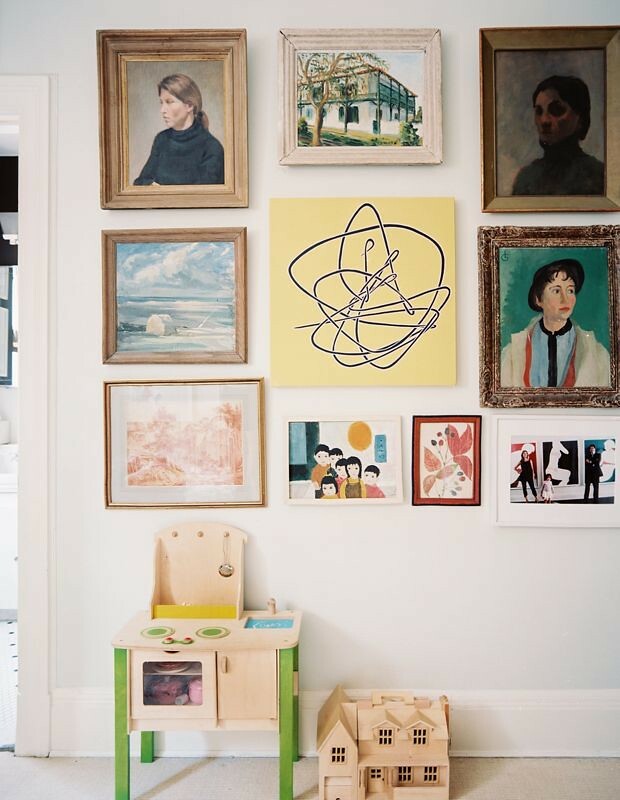 Have you thought to add a portrait painting to a kid's room? What do you think of this idea? Also from Lonny. Are you a fan of vintage landscape paintings, portrait paintings or modern interpretations of them? Where do you display yours if you have them? Where would you like to display them if you currently do not? Do you think they work in a child's room? Or?